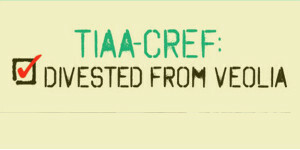 The We Divest coalition joins workers, environmentalists, and corporate accountability organizations in congratulating pension fund giant TIAA-CREF for removing Veolia Environnement SA stock (VIE:EN Paris) from its Social Choice Funds portfolio. In July 2013, TIAA-CREF’s website showed over $1.2 million in Veolia shares for its Social Choice Funds. Today it shows zero. TIAA-CREF still holds Veolia stock in its regular accounts. “Some of us in the socially responsible investment community are asking the question: does it make sense to own stock in a corporation that is violating international law in Palestine and committing so many environmental abuses around the world?” said Lincoln Pain, a Certified Financial Planner practitioner, specializing in socially responsible investments for over 27 years. “It is no coincidence that Veolia has a poor record on labor and environmental issues given its violations of international humanitarian law in Palestine. The complicity of multinationals in illegal projects in such a contested conflict zone reflects poor governance and risk management, and is often related to other corporate abuses. These companies have no place on any socially responsible investment portfolio,” said Dalit Baum, Middle East Program Director for the American Friends Service Committee (AFSC). Following public campaigns spanning four continents, Veolia has lost or failed to secure contracts totaling more than $18 billion worldwide. Last month, a diverse coalition of environmental, labor, Palestinian rights, and social justice activists in St. Louis, Missouri forced the multinational to withdraw from bidding on a city water contract. In Boston, Massachusetts, a broad coalition of labor and community groups are fighting Veolia’s union-busting tactics since it took over a school bus contract. In the San Francisco Bay Area, Veolia is known for the role its attorney played in opposing BART unions, and others have been protesting against Veolia subcontractors’ poor labor practices. Additional campaigns in Sonoma County CA; Los Angeles, CA; Seattle, WA; California statewide; Boston, MA; Baltimore, MD; Washington, DC; and beyond have cast light on Veolia’s controversial practices.